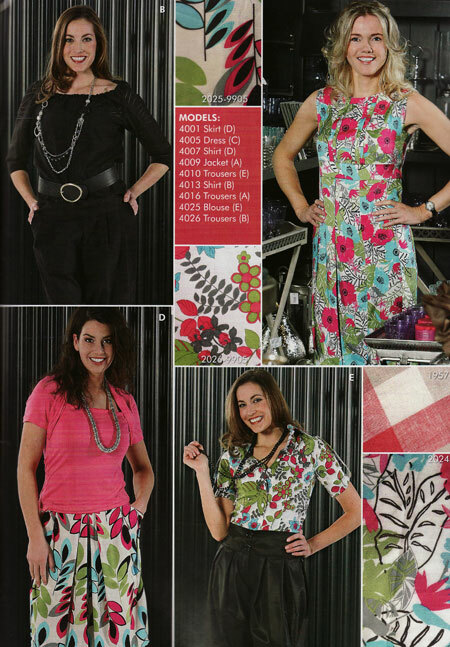 Most of my sewing patterns come from pattern magazines these days, partly because they’re so much cheaper than envelope patterns here, but also because I find the variety of styles so much more appealing than the Big 4 these days. So when a pattern magazine comes along that I’ve not tried before, I find it difficult to resist! I’ve already shown you the insides of Patrones, Burda WOF, and KnipMode and also La Mia Boutique, so I thought a lot of you might be interested to take a peek inside F.I.M.I. Magazine, too! What you’ll see here is the Summer 2009 issue of FIMI magazine – they appear to only print four issues per year, one for each season. 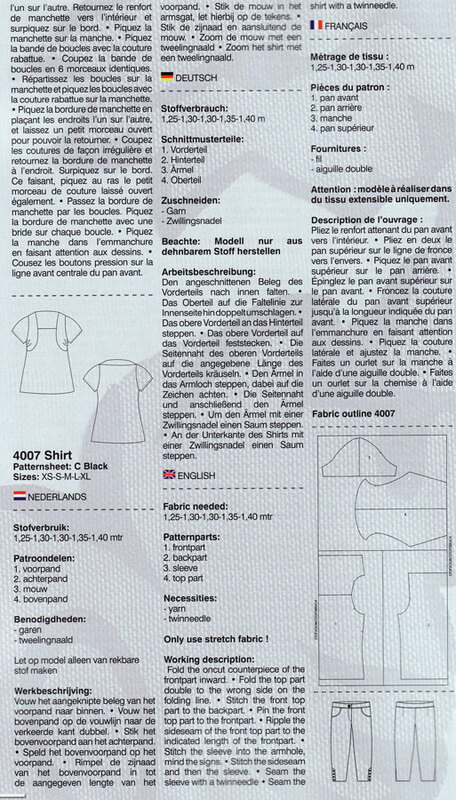 It’s Dutch magazine, but instructions are in Dutch, English, German and French, which is something I applaud for getting new sewers into pattern magazines, as they don’t seem quitue so scary when they’re in your native language. The pattern sizes are simply S-M-L-XL rather than the numbered sizes I’m used to, but I haven’t had a chance to make anything from this issue yet to see how true to size they are. The physical size of the magazine, however, is bigger than most magazines which are A4 (UK) or 8.5×11 (US) and big, thick, glossy pages – I couldn’t fit it all of this in my flatbed scanner! Here’s an example magazine page. 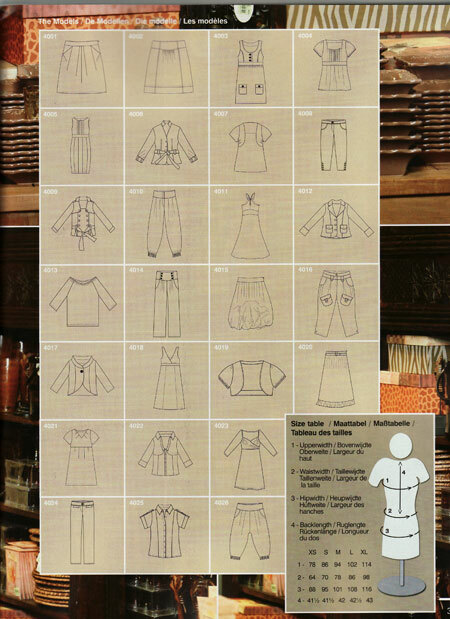 It feels a lot more like a trade catalogue rather than a pattern catalogue, to be honest. They sell the fabrics used in the designs, too, so you can look at the back and order them from Hobby World and make identical versions of the garments shown here. They’ve made each pattern up in about 10 different fabrics, so you get an awful lot of deja vu flipping through the magazine, but the photos are quite small. 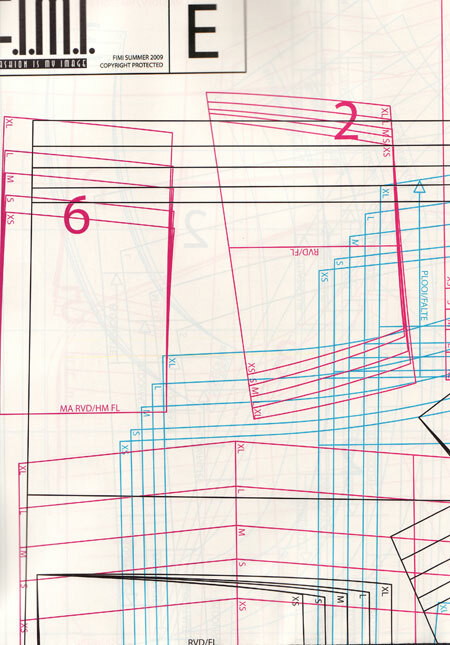 I think I would’ve preferred if they’d have a couple pages where they showed all ten versions of pattern 1 together, then shown pattern 2 together, etc so you could really get a feel for how it’d look in different fabrics. As it is, they’re divided the magazine into different style trends, with similar fabric styles grouped together. Here’s a portion of a pattern sheet. To my eyes it’s quite sparse (which means it’s easier to follow the line you’re tracing), printed on newsprint, and it reminds me of KnipMode’s pattern sheets. If you thought Burda’s clunky English was bad, though, just have a read of this! “Stitch the sleeve into the armhole, mind the signs”. I think “yarn” means thread, and “ripple” is gather, but it’s like translating into another language just to understand their English! So if you’re afraid to try foreign pattern magazines but think this would be better because it’s in English, think again! If anyone at FIMI is reading this, I’d love to be your freelance English sub-editor! I could straighten these out in a couple hours! All in all, it’s a good magazine with some decent basics, but for the price, (€s;8.30), you could have an issue of KnipMode or Burda, or buy two Patrones! And I think I prefer the designs in the other magazines, too, but maybe I just caught an off-issue here. Then again, Ottobre magazine‘s designs do absolutely nothing for me whatsoever, but I know a lot of people really love them, so perhaps there’s some great designs here that I’m just not into! So it’s not bad, but I personally wouldn’t be rushing out to buy another any time soon. Has anyone else bought FIMI before and could comment on how the patterns fit goes? I’d be interested to hear others’ opinions on this! Newsflash: For other UK readers, Totally Fabrics is having a 50% off everything sale through this Sunday (March 8). They’ve got a great range of printed lycra jerseys and I succumbed last weekend when everything was 40% off. I’ve used them before in the past and they’ve always been great! Separator image Posted in Inspiration, Magazine and tagged with fimi, magazine.